It started with Sahara really early this morning. I checked on the ewes at 2:30 this morning and she had a lovely ewe lamb next to her. She is a wildly marked girl and looks a lot like her mom. Sahara is a first time mom and she is doing a great job. Next it was Frodo’s turn. She was in the middle of having her lambs when I went out to do morning chores. She had two more girls. It was very chilly last night, so they are wearing coats to stay warm and cozy. 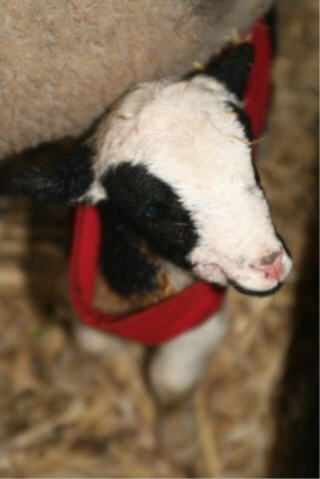 Her little ewe lamb, Peace, has such a sweet face. I was expecting a few other ewes to lamb this afternoon, but they aren’t ready quite yet – I’m sure they are waiting for the cold, dark hours of the early morning. However, Tess and Elsie surprised me this afternoon with lambs. Tess’ ram lamb was all cleaned up and running around. Tess always has the cleanest lambs. He is a silly lamb and is already jumping up on his mom. Elsie had a ewe lamb and you will have to wait for pictures because she was not clean 🙂 She is a very big girl with lots of leg. As I was leaving the barn Holly and Darling were fighting over the lambing corner, so I’m sure there will be more lambs to post about tomorrow. What is your current count of ewe lambs to ram lambs? It seems like you are getting a lot of girls this year! OMG they are so cute…..they are just so darn adorable in their lambie jammies!!!!! I gotta break mine out but hopefully it will be mild and balmy when I start Feb 10th. Keep those pictures coming…maybe a cute little boy would add a nice touch?! 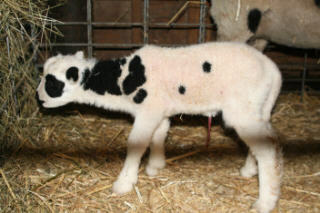 Adorable, can’t wait to see Darlings lambs. Keep them coming!!! Like you have nothing else to do right!!! Boy, Tess’s lamb IS clean! Your lambs look great – it’s sure makes me anxious for lambs here. A few weeks to go here. 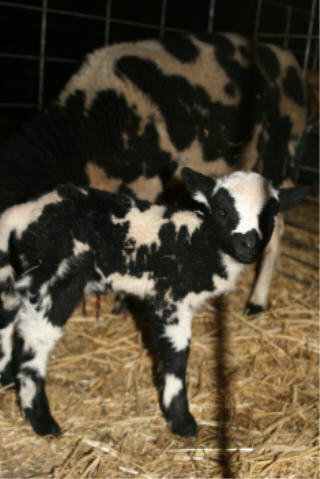 What beautiful pictures of the lambs.I just found your website and it’s great. 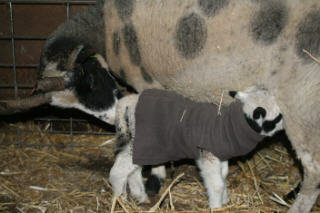 My ewe just lambed on the 4th of Feb.We got a 15 ewe(suffolk) lamb. I’m still waiting on another. 2 ewe’s and 1 ram have kept me busy. Hopeing for the husband to get my barn done this spring. I really like the jacob lambs.Good work.